The Carnival Sensation is a gem in the Carnival Cruises fleet: Experience the magic onboard! The Carnival Sensation was the third ship to set sail in the Carnival Cruise Line fleet. Up to 2,000 guests can choose from a variety of funky Cuba-inspired accommodation options, from comfortable Interior, Oceanview and Balcony staterooms to luxurious Suites. A varied and exciting entertainment program awaits you on board, in addition to a fantastic selection of complimentary and specialty restaurants, including Blue Iguana Cantina, Pizza Pirate and the exclusive Chef’s Table. There is fun for the whole family on board the Carnival Sensation, with a great range of activities and facilities for children and teens, such as the huge Waterworks Aqua Park, swimming pools, specially designed sports programs, handicrafts workshops and a teen club featuring movie nights, kid’s parties and games. Whatever your needs, you will have the cruise vacation of a lifetime on board the Carnival Sensation. The Carnival Sensation was the third ship to set sail in the Carnival Cruise Line fleet. Up to 2,000 guests can choose from a variety of funky Cuba-inspired accommodation options, from comfortable Interior, Oceanview and Balcony staterooms to luxurious Suites. A varied and exciting entertainment program awaits you on board, in addition to a fantastic selection of complimentary and specialty restaurants, including Blue Iguana Cantina, Pizza Pirate, and the exclusive Chef’s Table. There is fun for the whole family on board the Carnival Sensation, with a great range of activities and facilities for children and teens, such as the huge Waterworks Aqua Park, swimming pools, specially designed sports programs, handicrafts workshops and a teen club featuring movie nights, kid’s parties and games. 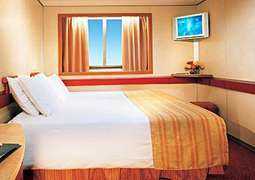 Whatever your needs, you will have the cruise vacation of a lifetime on board the Carnival Sensation. 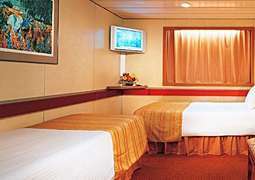 Carnival Sensation features incredibly comfortable staterooms for all needs, each characterized by a unique, Cuban-inspired styling and décor. 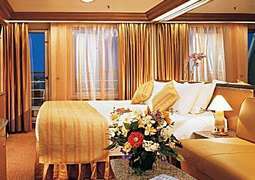 There are Interior, Oceanview and Balcony staterooms available, special family staterooms on offer and a luxurious range of Suites to cater to even the most indulgent tastes. Dining delights await you on board Carnival Sensation. A variety of complimentary dining options such as the Pizza Pirate and the Blue Iguana Cantina will satisfy the whole family’s palate, with specialty restaurants such as The Chef’s Table and Steakhouse Selections providing the ultimate fine dining experience. Carnival Sensation is synonymous with fun. There is a myriad of activities for the whole family, from a great range of kid’s activities to exciting evening schedules for adults. Camp Ocean, Seuss at Sea and WaterWorks are great age-appropriate options for children. Adult cruisers can have their funny bone tickled at The Punchliner Comedy Club, enjoy delicious, custom-concocted cocktails at the Alchemy Bar or dance the night away at the renowned Mega Deck Party on the Lido deck. Relaxation and rejuvenation await you on board the Carnival Sensation. Staying active is a walk in the park, with a fully-equipped fitness center, jogging track and mini-golf available. To unwind, escape to the Serenity Adult-Only Retreat, or one of the ships onboard spas and beauty salons. This is the floating resort that offers onboard atmosphere of endless fun and expectant excitement. The Sensation is the length of two huge football fields and stands ten decks tall. 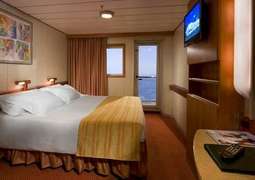 Her greater speed — and the fact that eighty percent of her cabins are outward-facing, and of those, the majority have balconies — make Carnival Sensation the perfect cruise vessel for special or longer vacations. The Sensation has a great deal of charming and elegant restaurants and cafes on board. The ship offers a variety of international cuisine ranging from American, French and Italian. Each restaurant will endeavor to make sure you enjoy all the culinary delights on their menus. Whether you take a trip to Guy’s Burger Joint with their massive portions or the Pizza Pirate restaurant for a more Mediterranean section, you will be spoilt for choice. For the night prowlers, why not visit the ships 24-hour pizzeria for a midnight snack? Carnival Sensation’s homeport is Nassau, the Bahamas from where it travels around the Bahamas and the Caribbean. Get in touch with our cruise experts to find out more!